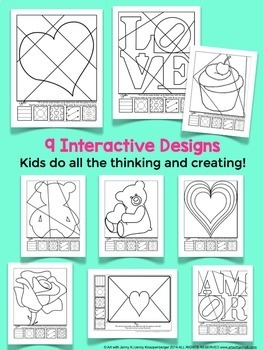 Valentine's Day interactive coloring sheets. 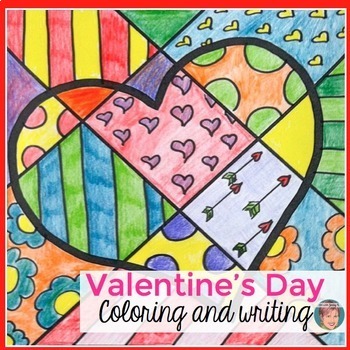 This set of “pop art” coloring sheets features a variety of Valentine's Day images that make a great accompaniment to your Valentine's Day celebrations. 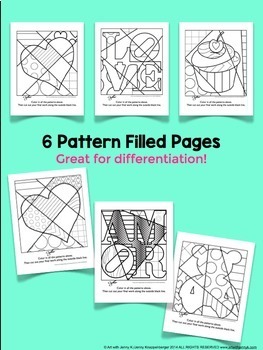 There are 9 interactive pages and 6 pattern-filled pages included in this Valentine's Day activity - appropriate for all ages! This set is but one of my collection of interactive Pop Art coloring sheets for all occations. I have combined all the major holidays and seasons into a single BUNDLE that I have made available at substantial savings! Blank envelope design - make up your own or have kids use to write a letter. As an art teacher, artist, and lover of all things “artsy,” I am a big proponent of “art for art’s sake.” My “pop art” interactive coloring sheets are designed such that they can be used any time in your classroom for the sake of making art. However, I am a teacher so I understand how hard-pressed classroom teachers are for time. 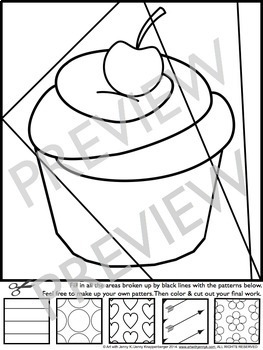 You might not feel like you can give up precious lesson time to let the kids “color.” In that case, I suggest that you can use these interactive sheets as writing prompts. For example, after completing the coloring sheet for the leaves you could ask, “Why do you love your parents?” I have included writing prompts in this product for you to use. "I found that my 5th/6th graders come to me and because of the focus on testing, never played with color or design or patterns. Your products give them that opportunity and I’ve seen so much improvement in their attention to detail as well as noticing patterns, lines, etc. It’s so much more than 'just coloring.'" ~E.D. Students spend a lot of thought and consideration when deciding where the patterns will go in each design. Students also have to color small details which improves their fine motor skills which help with many things--handwriting being one example. If your students were to make several of these (along with writings as well) they would have a beautiful portfolio at the end of the year! Interactive Coloring: Students spend a lot of thought and consideration when deciding where the patterns will go in each design. Students also have to color small details which improves their fine motor skills which help with many things--handwriting being one example. If your students were to make several of these (along with writings as well) they would have a beautiful portfolio! Pattern-filled: I have created many of the interactive images as pattern filled pages as well. This is to allow you some room for flexibility with students that might otherwise struggle to add the patterns themselves. These will allow you to differentiate among your students better. Testing is a part of life, as we know. So use these to start the brain in the morning before testing, or use them when students finish early so they have something creative to do after testing. I’ve even had teachers comment that these interactive coloring sheets are great to use with students when one-on-one conferencing is necessary to keep the other students engaged and busy. If you love these sheets, I have collections for all holidays and occasions. I've also collected many of these into my Interactive Coloring sheets book for Holidays and Seasons with over 80 coloring pages. Just click HERE to view this book! Valentine's Day Activity: Heart-shaped candy dishes using clay! Teachers love these coloring sheets too and that's why I made some just for teachers...they are free and can be foundby clicking here.